Part of the long history of Atlanta rests quietly in 469 banker’s boxes stored by the Department of Anthropology in Sparks Hall at Georgia State University. 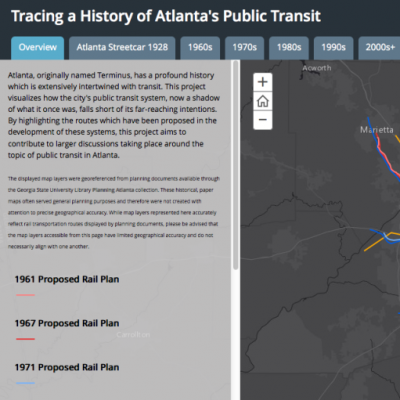 Comprising more than 100,000 artifacts recovered during construction of the Metro Atlanta Rapid Transit Authority (MARTA) rail lines in the 1970s, the Phoenix Project collection is potentially an archival treasure trove for urban archaeologists, historians, and cultural studies researchers. For the most part, however, these thousands of objects still keep their secrets, inaccessible and perhaps even unknown to scholars who might make use of them. Simply to catalog the holdings digitally, so the information could be made available to offsite researchers, represents a daunting task. The Phoenix Project collection stands as just one example of how physical cultural archives could benefit from the kind of trans-disciplinary collaborative digital scholarship conducted by the Atlanta Studies network. During the Fall of 2014, Dr. Jeffrey Baron Glover and I began discussing how we might collaborate with student researchers to catalog and digitize some of the Phoenix Project artifacts. The previous semester, I taught an upper-division multimodal exposition course—I am a full-time lecturer in English at Georgia State—and I was looking for a way to give the final object analysis project a clearer focus and extend the reach of students’ work beyond the class. Together, Dr. Glover and I selected about two dozen items from the Phoenix Project archive. Students in the Spring 2015 reboot of the course each chose one these artifacts to catalog and study over the semester, creating Omeka archive entries, 3D digital models, interactive timelines, and multimodal object analysis essays. In their work, students made use of technology resources available in GSU’s Collaborative University Research & Visualization Environment (CURVE), and they received support from Robert Bryant, one of Dr. Glover’s former graduate assistants and GSU Student Innovation Fellow. I taught the course again in the Fall 2015, this time with the assistance of a Writing Across the Curriculum graduate student consultant from the English department. 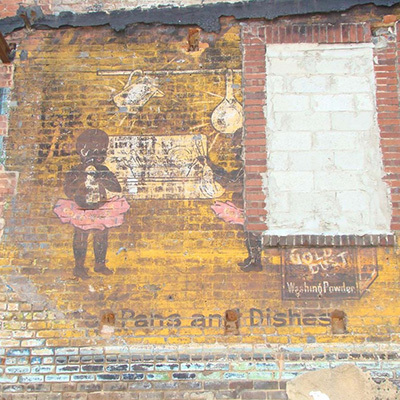 Much of the students’ work is accessible at atlantaartifacts.net, which runs on the Omeka digital archives platform. The cataloging, digitization, and preliminary research students have done already represent important contributions to the Phoenix Project. For example, one student worked with a fragile silver mesh purse that, on the advice of a conservator, is to be handled as little as possible. 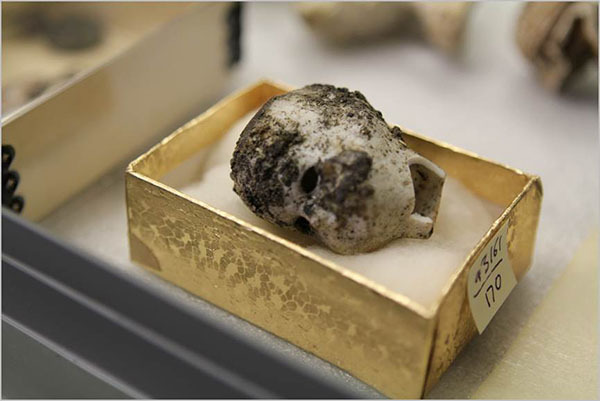 Her excellent exhibit and catalog entry, which include several high-resolution images and a digital model, provide potential researchers with at least some continued access to this artifact. Another student, corresponding with the original manufacturer who is still in business, discovered that the object labeled as a “ginger beer” bottle was actually used to store ink. And one student realized the ceramic flask with which she was working was acquired through an individual donation, and is not in fact part of the collection of artifacts recovered during the MARTA conservation efforts. The digital models students have created will eventually be included in the 3D Atlanta environment, along with some of the narrative history and description they have composed. The metadata and files from atlantaartifacts.net can be exported and imported into another platform, such as Heurist, where professional scholars and archivists can work with and add to them. 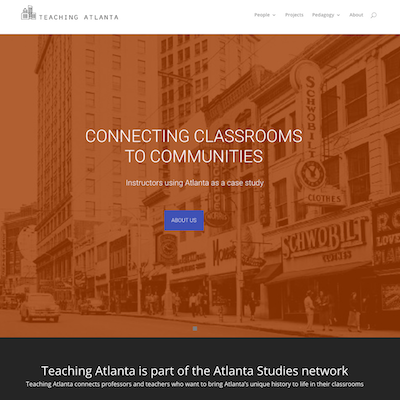 Digital humanities and the sort of interdisciplinary public scholarship produced within the Atlanta Studies network may be relatively new, but they are potential remedies to a persistent problem. Disciplinary silos, general lack of funding, problematic boundaries between teaching and research, all of these have contributed to a situation in which potentially useful physical collections—of books, records, artifacts, biological specimens, etc., etc.—gather dust while the histories they might help us to recover fade from our collective memory. By pulling archival material off of the shelf and putting it into the hands of students in the classroom, we add value to the archive while providing students with an authentic scholarly context for learning. The digital archives that result from a class like mine may be ephemeral and incomplete when compared to the material historical record they attempt to describe and explain, but they can provide valuable public access to that record while they exist. While the entire work of documenting and learning from a resource such as the Phoenix Project collection could never be completed by a single group of undergraduates over the course of a single term, students can nevertheless initiate that process, giving more experienced experts a place from which to begin. Rather than continuing to see students as consumers of the results of scholarship—in the form of textbooks and editions, for example—we should instead consider how we can involve them in this sort of work from the beginning, as contributors and collaborators.